In recent years, there has been a surge in people taking up Muay Thai. The sport was once seen as too brutal for the mainstream, but that simply isn’t the case. As these misconceptions are being dispelled, the sport is on the rise among people looking to get fitter and stronger. Let’s take a look at the many benefits of Muay Thai. The main motivation for most people beginning Muay Thai is fitness, a clearly measurable benefit. Muay Thai works multiple energy systems and builds both an aerobic engine and anaerobic capacity. While many forms of exercise require just one or the other, Muay Thai is a complete package. By training in Muay Thai, you will get stronger, faster and more powerful. You will lose fat and build lean muscle mass. Your coordination will improve and your metabolism will speed up. One of the main benefits of Muay Thai training is confidence building. You will be kicking, kneeing, punching and elbowing pads, bags, and people. You will unleash a fierce and confident warrior within, who is ready for anything that life throws their way. After training for a while, you will walk taller and feel more positive about yourself and your abilities. Speaking of abilities: harnessing kicks, knees, punches, and elbows effectively are all new skills. You will learn to throw powerful blows for when you truly need them. The increase in knowledge and self-defense capabilities allow you to hit the streets with a confident stride, knowing that you can defend yourself if necessary. With these new skills and extra confidence comes humility. The more you learn, the more you are aware of what you don’t know. The growing ego is kept in check by the knowledge that you are just beginning your journey. The respect you have for your teacher and the other students in the gym extends beyond those walls and into the interactions you have with others on a daily basis. Even when in a threatening situation, you are more likely to quiet your ego and find a way to avoid confrontation. Being able to extract yourself peaceably from a potentially difficult scenario is one of the great benefits of Muay Thai. You will gain the ability to find calm in a moment of stress. If you are sparring or doing a tough pad session, your fight or flight instinct comes into play. The repetition of this process brings you to a place of calm amid the pressure. You find yourself completely in the moment and everything else dissipates into irrelevance. There is only you and that moment. When things get stressful in everyday life, you will be able to go to that calm space, then get on with the task at hand, rationally and logically. After hitting the pads, you feel very much at ease. All of the emotional baggage and ego is gone (for the most part). 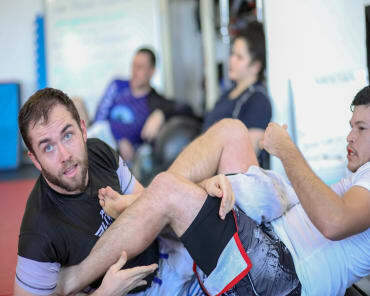 While not a cure for serious psychological conditions, Muay Thai gives you the chance to blow off some steam and shake off the day’s emotions. The things that have been upsetting you or getting under your skin dissolve as you put your body to work. These are just a few of the many benefits of Muay Thai. You will get fitter, physically and emotionally stronger, more confident, more respectful of others, humbler and less stressed, while picking up new skills. All these, while having a lot of fun and making new friends in the process.